An important part of my iSGM 2.0 black and white photography post processing workflow that is extensively described in my 424 pages eBook From Basics to Fine Art – Black and white photography, architecture and beyond, written by me and co-author Julia Anna Gospodarou and in my new 3.5 hour B&W post processing Speed workflow tutorial is the use of luminosity masks as an additional and important tool to control the light intensity in very specific and isolated parts in a black and white photograph. The combined use of luminosity masks and hard selections (selections created by the use of basic selection tools like the Quick Selection tool in Photoshop) form an essential part of my black and white photography workflow since 2013 and is the recommended way of isolating and, hence completely, controlling the two most basic elements in any black and white or colour photograph: light and shapes. In my black and white post processing workflow shapes can be isolated and controlled by creating hard selections and light can be isolated and controlled by creating luminosity mask selections. Combining the two masking and selection techniques and adding gradients in the masks for subtle transitions between adjusted and unadjusted parts in an image, gives you ultimate control over your black and white photographs in a way so subtle it cannot be matched by traditional dodging and burning. Luminosity masks are a Photoshop feature that allows you to isolate specific parts of an image based on the light intensity of pixels. It is a concept made popular and described extensively by Tony Kuyper and is considered one of the most important tools to control light in Photoshop. Luminosity masks are very easy to create in Photoshop, much easier than creating hard selections in Photoshop. 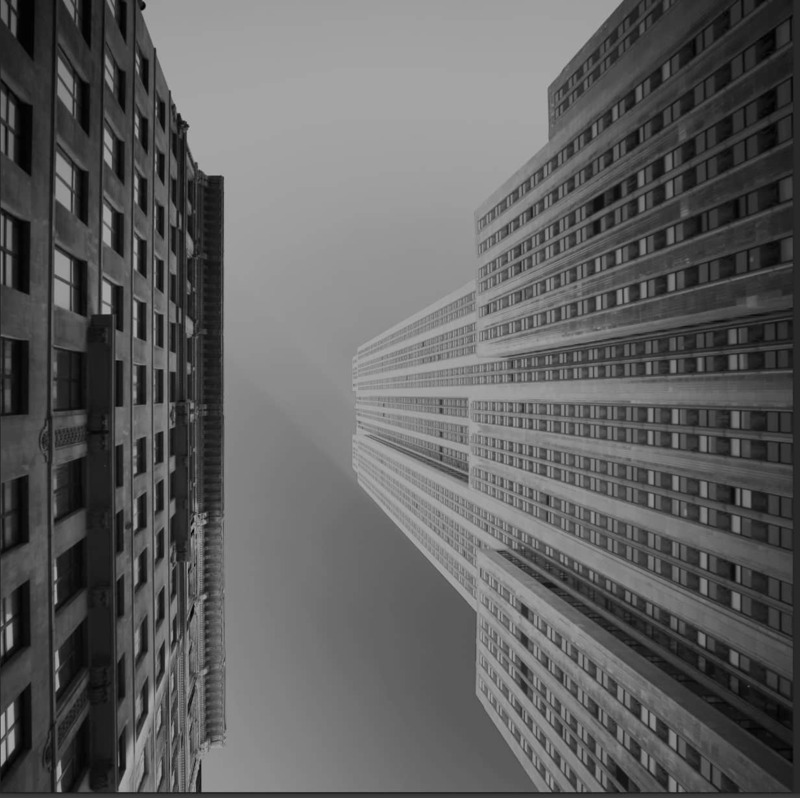 Basically you can create beautiful black and white photographs just by using luminosity masks only. The downside is that since luminosity masks are based on the light intensity of pixels, they will not give you control over shapes. People familiar with my black and white post processing method of iSGM know that creating presence, or adding 3D like depth to objects in an image, form an important visual aspect of my black and white photography approach. Adding 3D like depth however can only be achieved if you isolate objects or part of those objects. Hence, if you can control the shapes. This can only be done effectively if you create hard selections to isolate shapes. 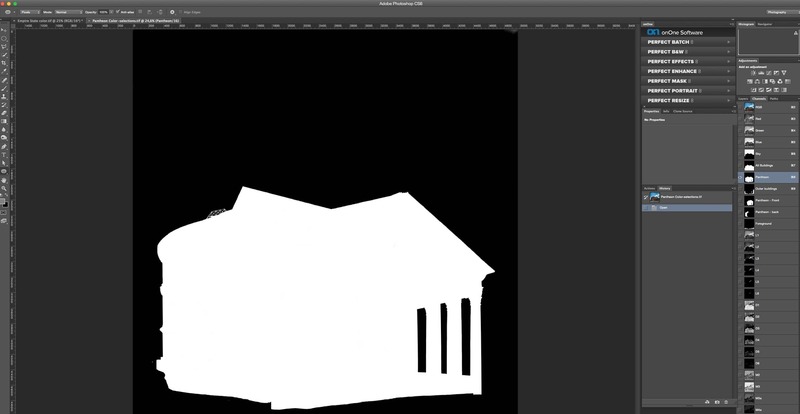 For example: if you isolate each side of a building and the building itself from the background environment. Luminosity masks will not isolate those specific parts of a building, but at best just random parts since they’re always based on the light intensity of pixels. 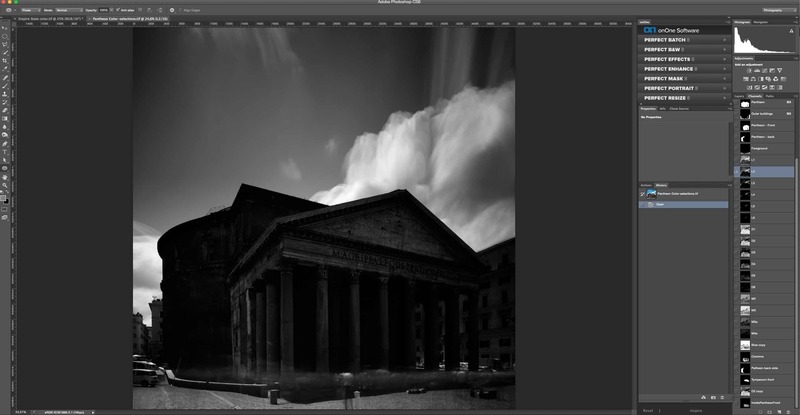 In the following images you see how a hard selection of my Pantheon photo looks like and it will illustrate the difference between the use of hard selections and luminosity masks. 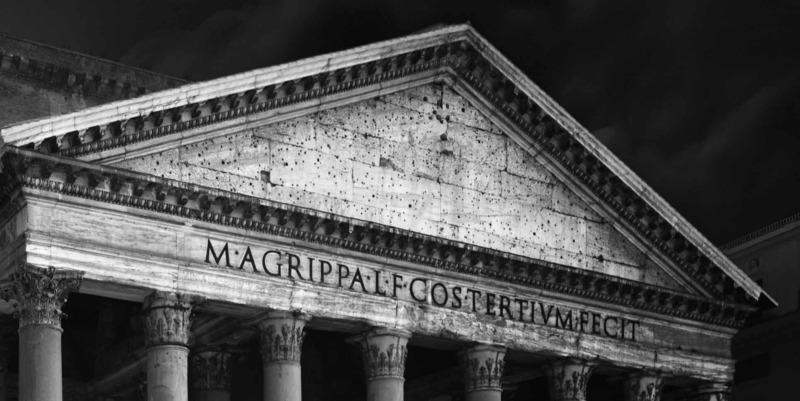 First here’s the original color photograph of the Pantheon building and also the end result in Black and White. 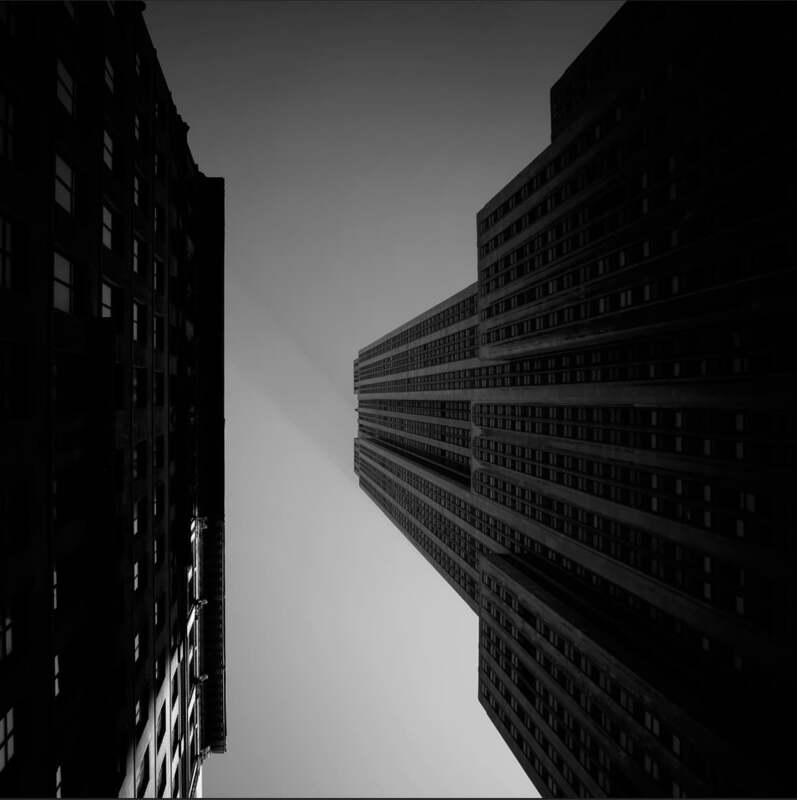 To obtain a result like the black and white photo I presented, based off the color photograph, you need to be able to control all the various subjects in the image, based on their shapes, regardless the light intensity in shapes, and also you need to control the light, based on the light intensity of pixels, regardless the shapes. Shapes can be controlled with hard selections, light can be controlled by luminosity masks. 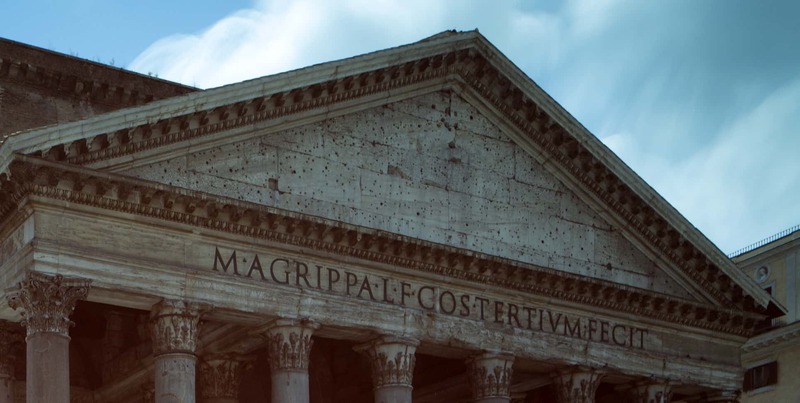 I’ve created the hard selection to separate the Pantheon building itself from the rest of the background and foreground. Black conceals, white reveals (is selected). 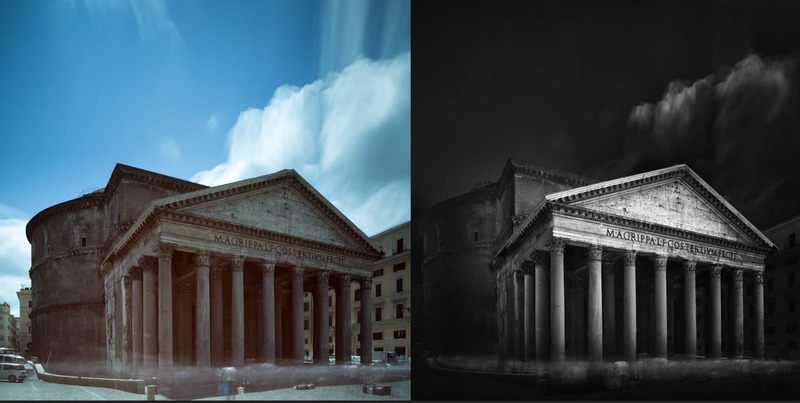 It’s impossible to isolate the Pantheon building in the same way with the use of luminosity masks since the same light intensity can be present anywhere in the photo, regardless the shapes. What I created here is the so called Dark luminosity mask. Keep in mind that white reveals and black conceals. But opposite to the hard selection mask there’s not just black or white, but all sorts of tones in between. The darker the tones, the less will be revealed and the lighter the tones, the more will be revealed. Complete white will reveal everything, complete black will hide everything when using the mask. The building is not complete white and the sky and rest of the background is not complete black. 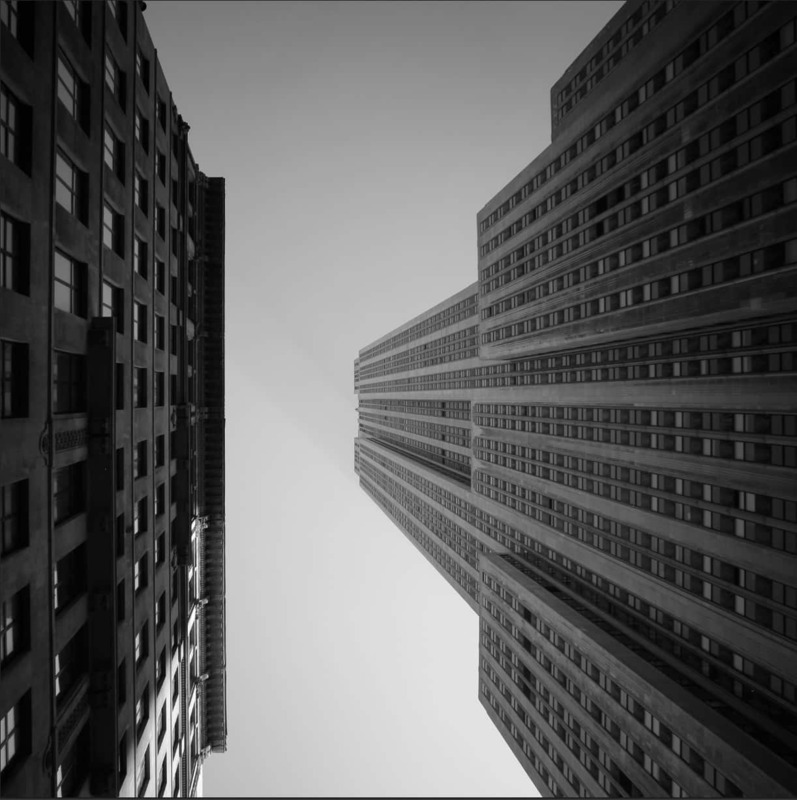 Hence, the building is not completely isolated and when trying to adjust the tonality in the building for example, this will also result in adjusting the tonality in the rest of the photo, especially in the sky. And that’s something that you cannot use when trying to ‘control light and shapes’ to create presence in a building for example. 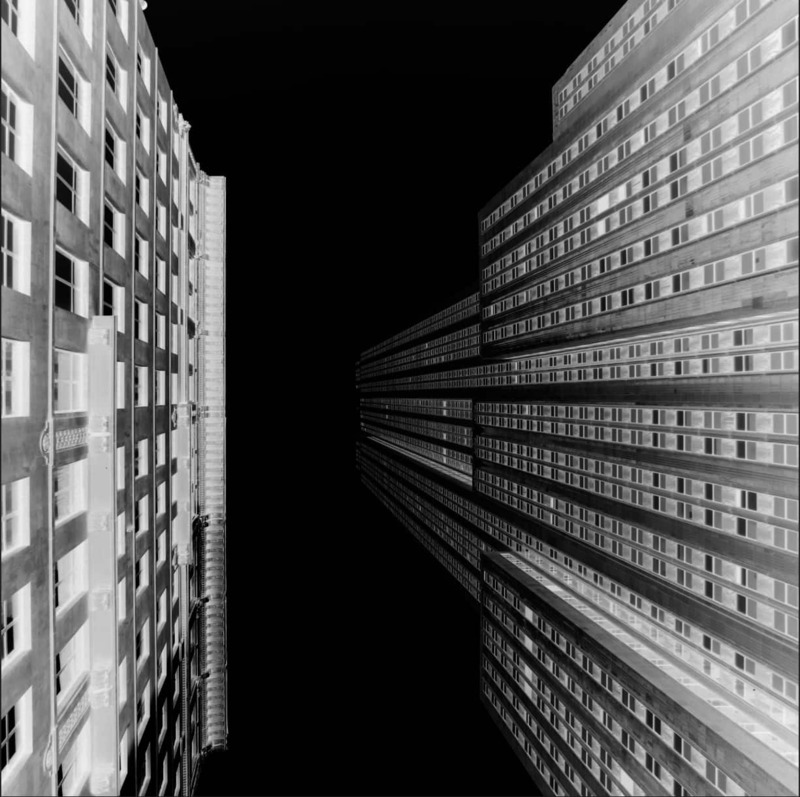 In this instance I created a hard selection of the sky so I could isolate it completely from the rest of the photo (buildings, foreground, etc.) and therefore give it a darker look like you see in the final B&W result. Again, white reveals, black conceals. There are no other tones meaning you will either reveal of hide (parts of) the sky with the mask. Again, white reveals, black conceals, but there’s not only pure black or pure white, there are many grey tones in between. Even though I will be able to isolate large parts of the sky, anything I would do with that sky will also effect parts of the building and the foreground. But most of all I won’t be able to control the whole sky since a large part of the sky is mid grey while only the clouds have some local white areas. When converting to a black and white photograph I wanted to brighten up the whites in the tympanum without losing any of the details. With only a hard selection you could isolate the tympanum and then boost the whites in that part (by using the curves tool and then mask out the rest) but you will lose the sharpness and contrast of the details in the tympanum. With only a luminosity mask you can isolate all the brighter parts in the tympanum, but you will surely affect the sky and the rest of the photo too. But by intersecting a well chosen luminosity mask with a hard selection of the tympanum and applying a gradient in the mask (iSGM method), you can boost up the whites in the tympanum but you won’t lose any of the contrasty details in the tympanum. 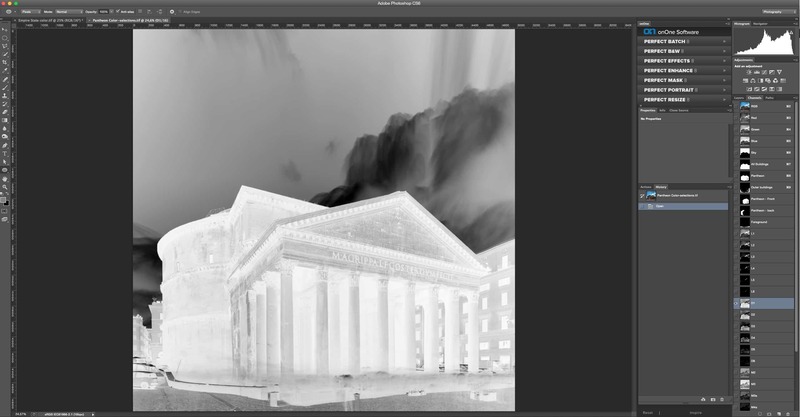 What’s even better, if you use another luminosity mask and intersect it again with the hard selection of the tympanum you can isolate the details in the tympanum and make it even more contrasty and sharp. 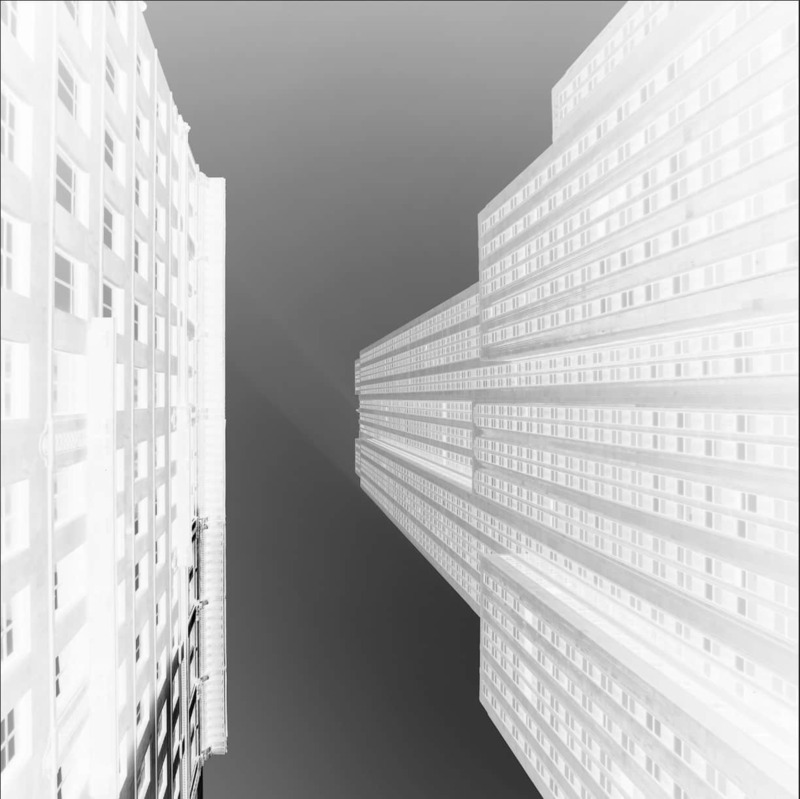 I’m not going into the possibilities of controlling both light and shapes by intersecting hard selections with luminosity masks and applying gradients into the mask to mask out (or in) specific areas with changed tonalities, in this article. Those are aspects that are extensively described in my B&W online mentorship programs, the workshops and also in my 424 pages eBook From Basics to Fine Art – B&W photography, architecture and beyond, written by me and co-author Julia Anna Gospodarou and partly in my 2.5 hour B&W long exposure photography masterclass video tutorial that is focused on the use of hard selections only. My new Black and White Speed workflow video tutorial however will contain this all and even a suggestion to speed up the black and white workflow process. That video tutorial has been available since early December 2014 and can be ordered here. In this introduction I will show you only how to create luminosity masks, but hopefully this introduction will give you an idea why I use hard selections together with luminosity masks to completely control the end result. 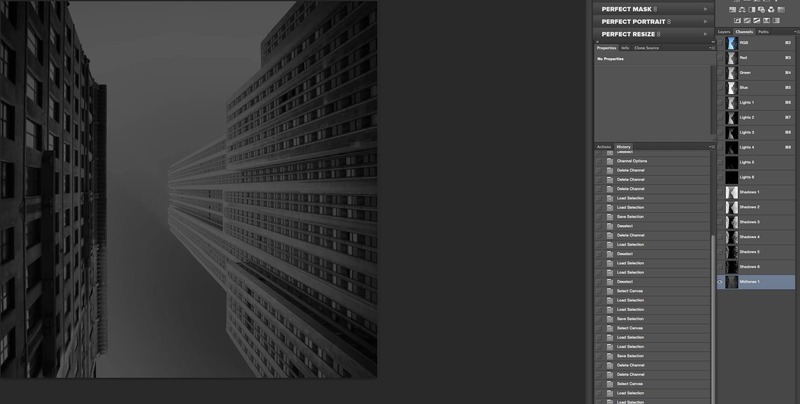 Now that I have explained what a luminosity mask is, it is time to create one. I typically create 3 kinds of luminosity masks: one for highlights, one for the shadows and one for the midtones. I will start with the highlights. But before I do that it’s good to note that usually the luminosity masks are created based off the original colour image, not from the black and white converted image. Although to obtain even more control I sometimes also would create an additional set of luminosity masks based off a black and white version that forms a great starting point for the rest of my black and white conversion. But you will see that in 90% of the cases it will suffice to create luminosity masks from the original colour image only. Open the image you want to work on in Photoshop. 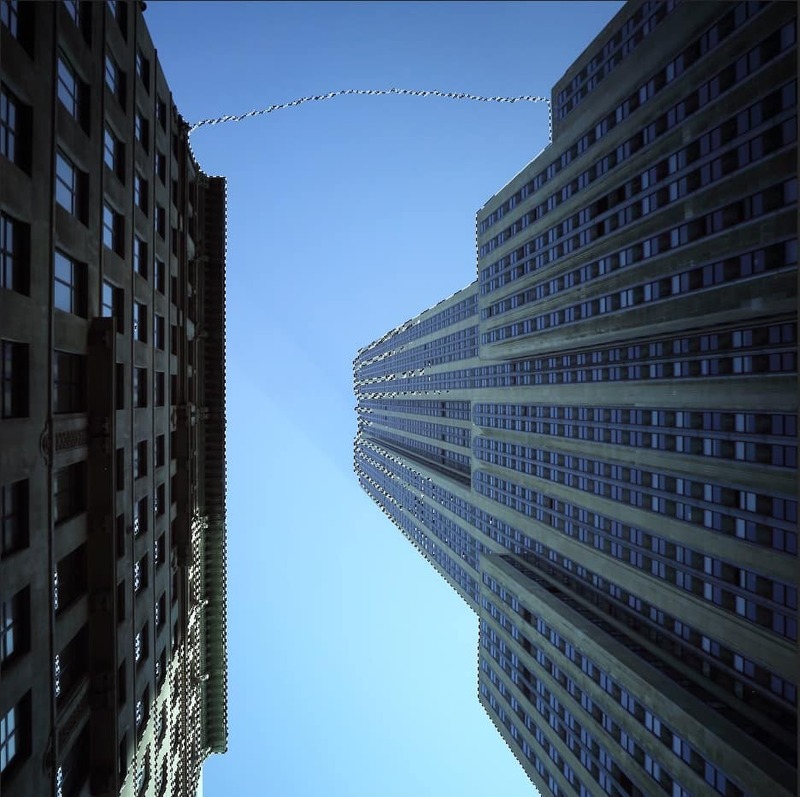 I will use an image of the Empire State Building. Go to the Channels menu on the right side of the screen, it is next to the Layers menu. If you do not see this menu, go to “Window” –> “Channels”. Hold “CTRL” (PC) or “CMD” (Mac) and left click on the RGB channel. Left click on the RGB channel while holding “CTRL” or “CMD”. If you did this right a selection will appear. The selection created by left clicking on the RGB channel while holding “CTRL” or “CMD”. Save this selection by going to “Select” –> “Save Selection”. Now name the selection. I am going to create several selections, about 5 or 6, all based on the highlights of the image. That is why I named this selection “Lights 1”. Usually a set of 6 light luminosity masks, 6 darks luminosity masks and 3 mid-grey luminosity masks are sufficient to isolate and control light in all its intensities in a typical photograph. But if you see that 6 are not enough then don’t hesitate to go all the way up to 9 or even 10 light and/or dark luminosity masks. 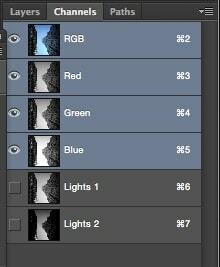 For mid-grey it will usually be useless to create more than 3 luminosity masks. 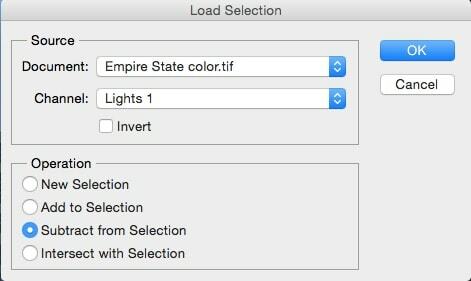 The next selection is created by going to “Select” –> “Load Selection”. Under “Channel” choose the previous selection you just created. In this case “Lights 1”. Under “Operation” choose “Intersect with Selection” (intersecting Lights 1 with Lights 1). You now have created a new selection. Note: in this case it’s assumed that the selection you created as lights 1 is still active (loaded and not deselected or replaced) and else load it again. You will need to save this new selection and give it a name. I named it “Lights 2”. You can see the 2 selections under “Channels”. Now repeat these steps until you have 5 or 6 selections, depending on the highlights of your image. So, to create the next selection go to “Select” –> “Load Selection” and choose the last selection you created. In this case “Lights 2” and intersect it again. 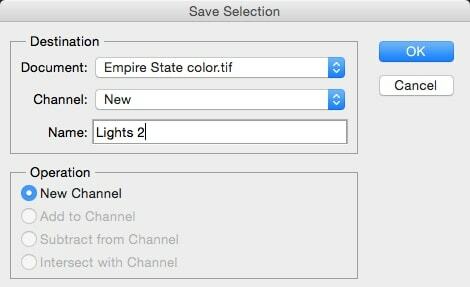 Then save it as “Lights 3”. You can repeat these steps as often as you like, but I usually do not create more than 6 selections for the highlights. To summarise: when creating the next selection always load the previous selection and intersect it and then save it. Lights 1: Again, the luminosity mask selection is not just black or white but has various tones in between since it’s based on the light intensity of pixels. Pure white will reveal, pure black will conceal, and for everything in between: the lighter the tones, the more will be revealed when you use it in a mask. Lights 2: When you compare Lights 2 with lights 1 you will see that the highlights are even more isolated. If you would compare lights 6 with lights 2 then you will see that only a small part of the sky (the brightest part) is visible and therefore will be revealed when using the luminosity mask selection in a mask. 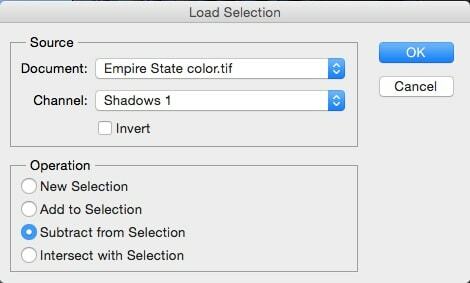 The process for creating the selections for the shadows is basically the same as for the highlights. First, deselect by going to “Select” –> “Deselect”. Load the first selection you have made, in my case “Lights 1”. 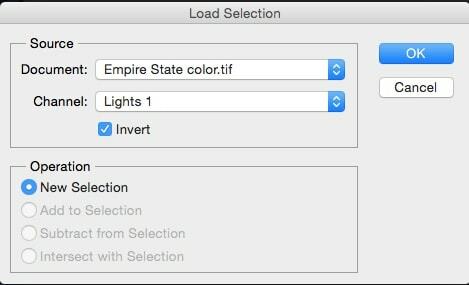 Load the selection and make sure the “Invert” box is checked. This wil invert the selection and instead of the highlights the shadows have now been selected. Save this selection and name it something like “Shadows 1”. To create the next selection, load the previous selection (while the previously created selection Shadows 1 is still active and loaded), intersect it with the current active selection (Shadows 1 intersecting with Shadows 1) and save it as “Shadows 2”. 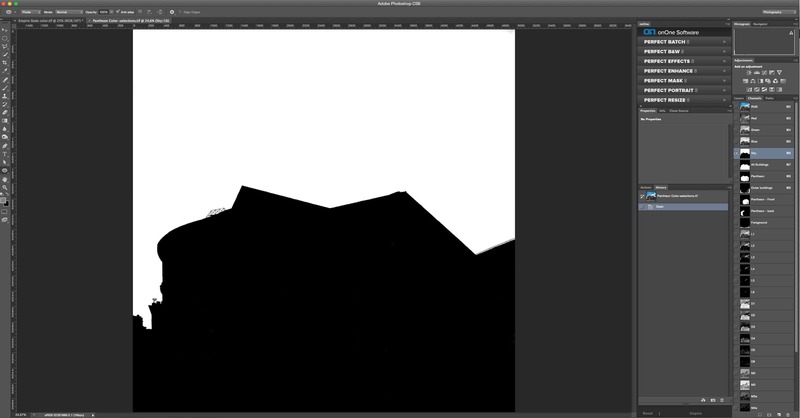 Now in a more detailed break down of steps: Load the last selection – in my case “Shadows 1” – and intersect it. Do not invert the selection. You only need to do this once, when you make the first shadows selection. Save the newly created selection. To create the next selections, repeat the steps. So, to create “Shadows 3”, first load “Shadows 2”, intersect and save. Shadows 1: pure white reveals, pure black conceals, everything in between: the darker the less will be revealed. The sky in this case will just be revealed for a small part while the building has large parts that will be revealed. Most of the times just using the shadows 1 will not give you enough isolated control over specific targeted shadows. Shadows 4: comparing shadows 4 with shadows 1 will show that the sky will not be revealed at all and only the lower part and just a small part of the top of the Empire State will be revealed. This gives you much more control over the shadow areas in this image. But creating a Shadows 6 or even Shadows 7 will isolate the darker parts of the image even more. Finally, I like to take it even one step further and create selections for the midtones. First, make sure no selections are active by deselecting. Go to “Select” –> “Deselect”. Now select the entire image by pressing “CMD + A” (Mac) or “CTRL + A” (PC) or ‘Select all’. Then load the first highlights selection and choose to subtract it. After I selected the whole image I load the “Lights 1” selection and choose to subtract it from the ‘complete’ selection. Then I load the “Shadows 1” selection and subtract it yet again. You might get a warning, just hit “OK”. What you will see on your screen is that it looks like nothing has been selected: the selection is so subtle that you can’t even see it in normal mode. Now save the selection as “Midtones 1”. The “Midtones 1” selection as shown in Channels. I usually create 3 midtones selection. 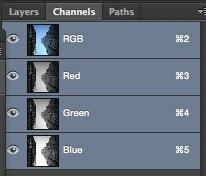 To create “Midtones 2” and “Midtones 3” you will need to repeat the same process, but with some slight changes. For “Midtones 2” use the corresponding “Lights 2” and “Shadows 2”. For “Midtones 3” use “Lights 3” and “Shadows 3”. For “Midtones 3” it would look like something like this: select the entire image (CMD/CTRL + A), load “Lights 3” and subtract it. Load “Shadows 3” and subtract it. Now save the selection as “Midtones 3”. As you can see there’s a minimum amount of pure white and a minimum amount of pure black. If you would use this luminosity mask selection in a mask then you will see that large parts of the image will be shown. Not ideal to give you control over specific targeted areas but a good mask for a global correction of midtones. I finally ended up with 15 selections. It would be quite time consuming to make all those selections for every image you are working on. To save some time, create an action. You can find the “Actions” menu next to the “History” tab. If this window is not active, go to “Window” –> “Actions”. Once you hit the “Record” button, start creating all of your selections. Once you are done, press the stop button. Don’t forget to stop recording once you have finished all of your selections. Now that you have created an action for luminosity masks you can play this action for every new image. It will load all of your masks within seconds. Hello, thank you for this tutorial, I did it all but what do I do now?? How do I incorporate this into the black and white retouching and with other techniques like high frequency separation and dodge and burn?